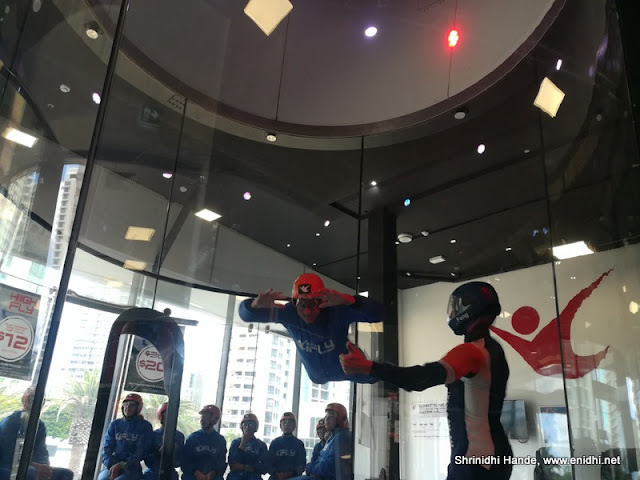 I had seen iFly Indoor skydiving first in Singapore’re Sentosa several years ago- but that time dismissed it has expensive. 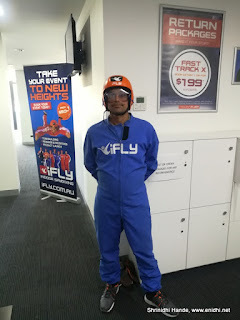 Recently decided to try the iFly Indoor flying adventure in Gold Coast. This post shares my experience. What happens inside iFly Indoor Skydiving? Indoor Skydiving is the reverse of traditional skydiving. 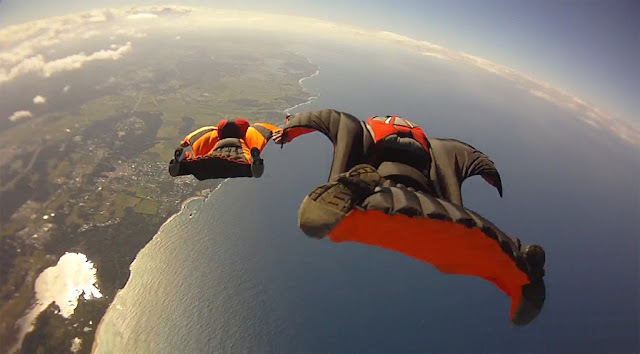 In traditional skydiving, you jump from a height, gravity pulls you down, you’ve to manage your free fall, open parachute for lift and do a controlled landing. iFly indoor skydiving is the opposite. Here you enter a wind tunnel like setup- powerful motors operated by a controller provide strong upward moving wind. When you enter, you need to bend forward and lie parallel to the ground, the strong wind current will ensure you’re up-float, provided you maintain correct body posture. Thus you get to float in air for a few moments. An instructor will assist you in the process to ensure your arms and legs are in right position to stay afloat. They can also tandem with you and take you high up- known as high five, for extra fee. 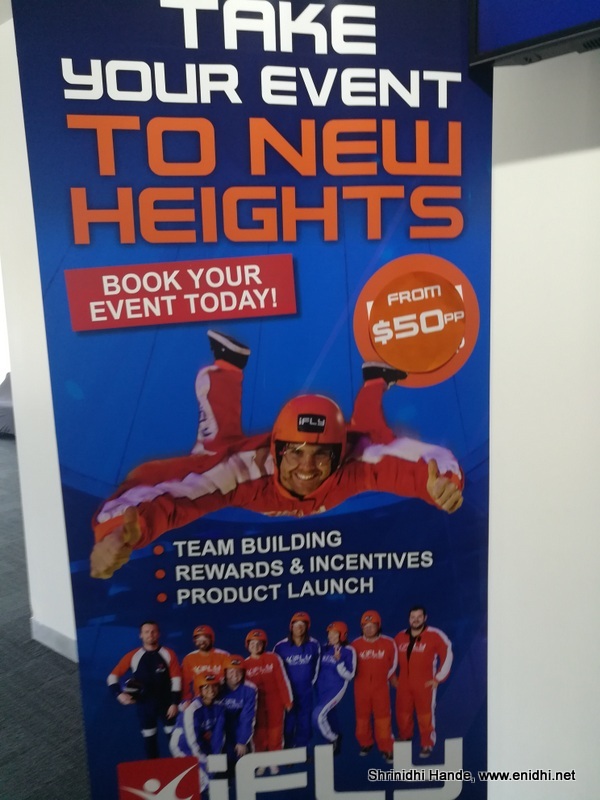 iFly Gold coast had a week day offer of 69 AUD (weekend 99 AUD). Plus a high-five costs 10 AUD more. High five is when instructor tandems with you and takes up to the top of the wind tunnel in couple of random swings. It is worth to avail this. 1 AUD = 52 INR. Duration: Actual time in wind tunnel for your 69 AUD will be only 2 minutes per person. Include signing indemnity bond, briefing, dress up and waiting time, whole activity will take about an hour. Family members can watch for free from viewing gallery. You can buy some souvenirs like caps, pens, t-shirts if you wish. Lockers will be provided free of cost to keep your stuff. Nothing is allowed on your person while entering wind tunnel. Spectacles are OK, as they will be held in place by a plastic eye wear that will be given. I did my booking few days earlier and went to the venue on designated date and time. I had to wait a few mins as I was early. Once inside, I was asked to fill indemnity bond and declarations on a computer. Post which I was led to a waiting area, where previous batch was in action. We saw them in action and got an idea of what to expect. Watch videos at the end of the post to get an idea what happens inside. Then we were led to a briefing room, where a short video was shown-there’re a few hand signals we should memorize- like relax, legs straight, leg fold, chin up, all good etc. 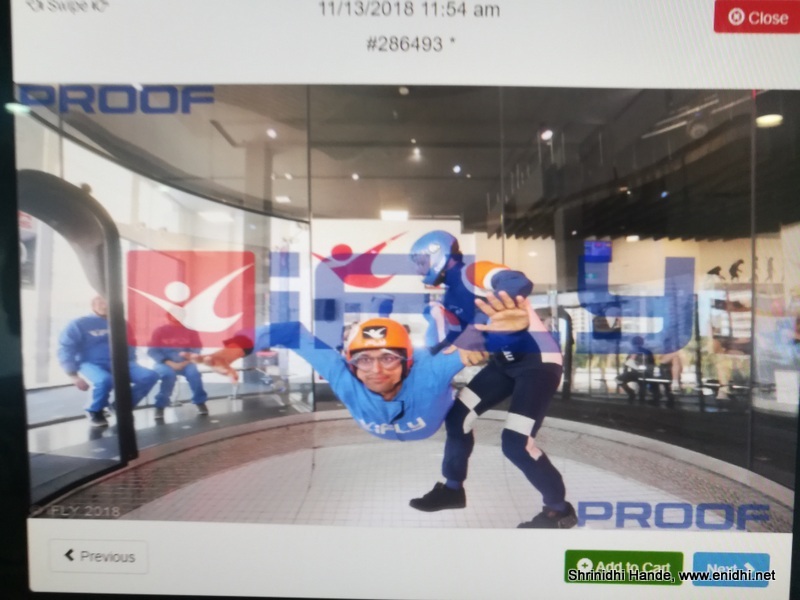 iFly Indoor skydiving is NOT recommended for pregnant women, those with neck pain, back/shoulder pains etc. Post briefing, we were given our jump suits, helmet and safety goggles. Next we enter the chamber and wait for our turn. Instructor would take one person in at a time and help them float. One minute gets over very fast, before you get a feel of things. The entire duration is two minutes, which is done in two rounds. On second round, after 30 seconds of floating, instructor signals operator to increase speed, then tandems with the student and flies to top. Keep your body vertical to focus weight downwards and you will come down, keep your body flat to gain more surface area and you will float/go up. Most of the work is done by body movement and shifting of weight/centre of gravity, part of the flying needs assistance from the operator to increase/decrease wind speed. Photos/videos cost 50 AUD extra. iFly Indoor flying is a good fun, but is no alternative to actual skydiving. Read my actual Skydiving experience here. 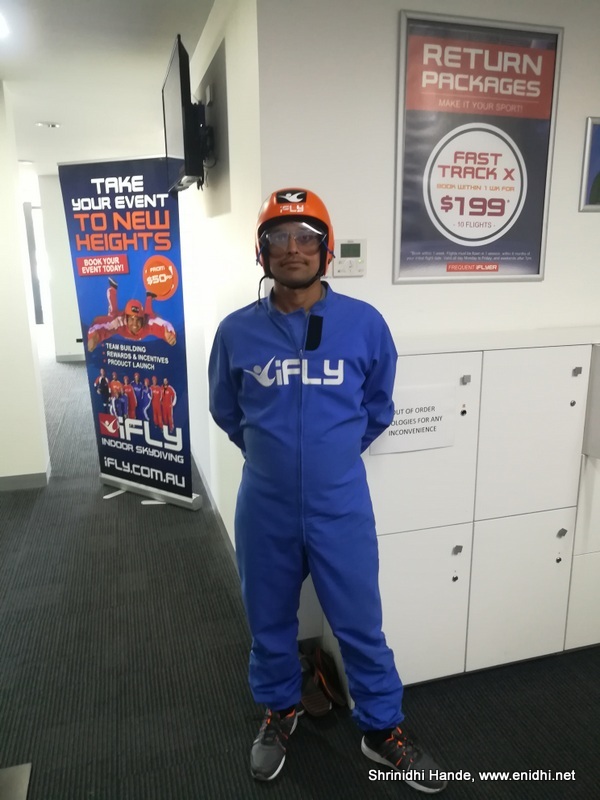 But Skydiving costs 5 to 10 times more (depending on type, jump height, where you try etc) so iFly is a good cheaper way to float for a few seconds. Two minute duration is too little to get the hang of it or enjoy floating. It is the same problem with most tourist attractions- to make more money they need to limit the time n process more people. They can't give lots of time for students to practice at their will and get comfortable. Of course any adventure/outdoor activity costs lots of dollars, so I won’t say don’t try- it is a fine experience to know how it works. Serious people can take multiple rides or advanced courses for better fun. 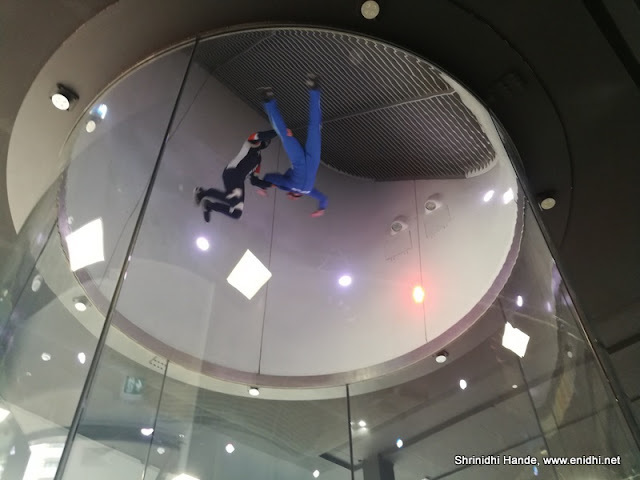 Their website has lots of packages to suite every needs- for example, you can have the wind tunnel for yourself for one full hour, for about 990 AUD (INR 52000) but it is lots of money for regular tourists/middle class people. 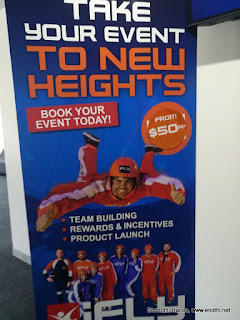 If you don't like this indoor flying, other major adventure things you can try in Gold Coast Surfer's Paradise are: JetBoat ride (high speed boat ride in the river), Seaplane ride (Around 70 AUD for 5-10 min joy ride), Climb to top of Sky Deck (75 AUD per person onwards in addition to 25 AUD Skydeck entry ticket) etc. Also I feel the jump suite could have been modified for better lift- like the ones used by wing-suit riders- if there’s a cloth lining covering the body and arm, it would have provided more surface area when arms are spread and thus more lift and help students float better. Refer image below. Of course, this is just my thought- I don’t have means to test this. wow amazing. Watched your Skydiving video.